So here’s the thing, I’m getting old and I’m not in the loop anymore! I had a night in town a couple of weeks ago with a friend. We were going to have dinner and then go out on the town, problem was neither of us could name a place that attracts our ‘age group’. Needless to say we were in bed by 11.30pm and up early enough to watch an absolutely breathtaking sunrise. But I was happy with that. I have to admit that there is nothing attractive about hitting the town these days, maybe we didn’t know the right places but I think even if I did know the right places I really don’t think thats my ‘thing’ any more. I say this sitting here on a Saturday night, watching a kids movie and knitting scarfs for the kids affected by the recent earthquakes in Nepal. You might think thats a bit sad, but I enjoy my life. I value my bed, highly, and my cup of tea in bed on a Sunday morning that my loving husband brings me before taking Caelan to Auskick. I even get to read the travel guide from the Herald Sun and that just makes my day. The other day I come across a blog post titled ‘21 Melbourne walks that will take your breath away‘, it has since gone viral. So of course having lived here pretty much all my life, give or take a few years, I thought I would have ticked off a few of these. Well to my amazement I had not ticked off even one! Most of all I was overwhelmed with the thought that there are awesome places in my own backyard that I didn’t know of. Shouldn’t really have been surprised considering I don’t even know where to go for a drink these days! So I said it out loud to Craig that we are going to do them all. Yep all! You heard me right! Update to 2018 – we haven’t yet! 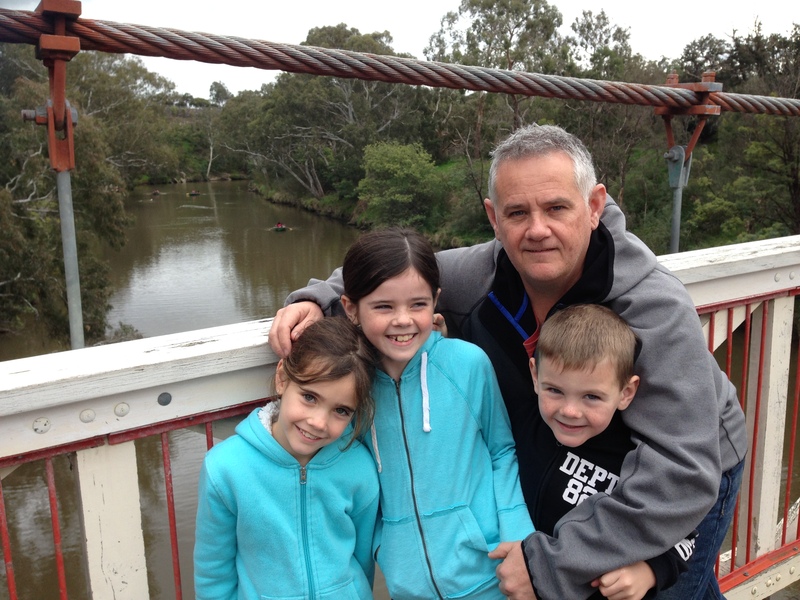 So off we went today for our first walk starting from Studley Park Boat House round to Dight’s Falls. 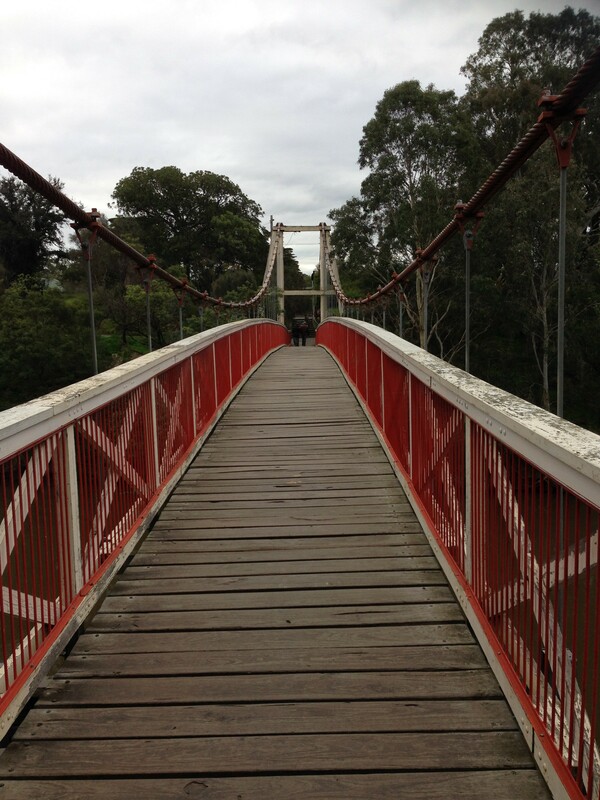 Its nearly a 5km return trip, and it took in some lovely views and walking down by the Yarra River. 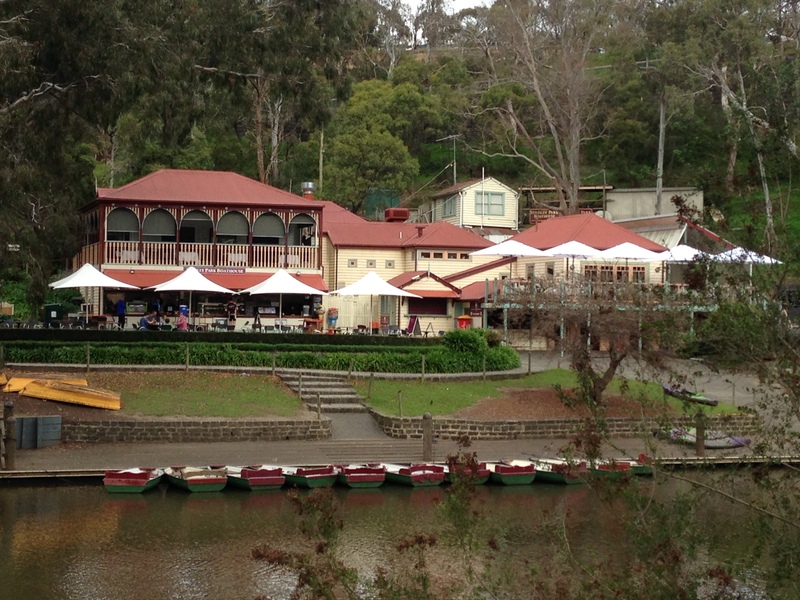 We had a picnic lunch at Studley Park Boat House before heading off. The walk was rated easy and it was nice getting out in the fresh winter air. It was fresh but not freezing, the winter so far here in Melbourne has been mild which of course suits me because I hate the cold. I was chatting to a couple of young girls at Dight’s Falls, they were on their bikes and had ridden from Bulleen to Collingwood. Craig had just suggested bringing the kids down on the bikes one day, the girls suggested we park around Dight Falls and then ride the bikes into Southbank. Its pretty flat and a nice ride and you get to take in some really pretty city views. I thought that would be nice one day too. I love city views, they float my boat, as some would say! I think the views here would be awesome just on dusk. We went there a couple of times when I was young with my dad. The Boat House has a beautiful area, there are plenty of places for a picnic and there’s a cafe and restaurant there also. You can hire boats and have a paddle around, rather romantic! 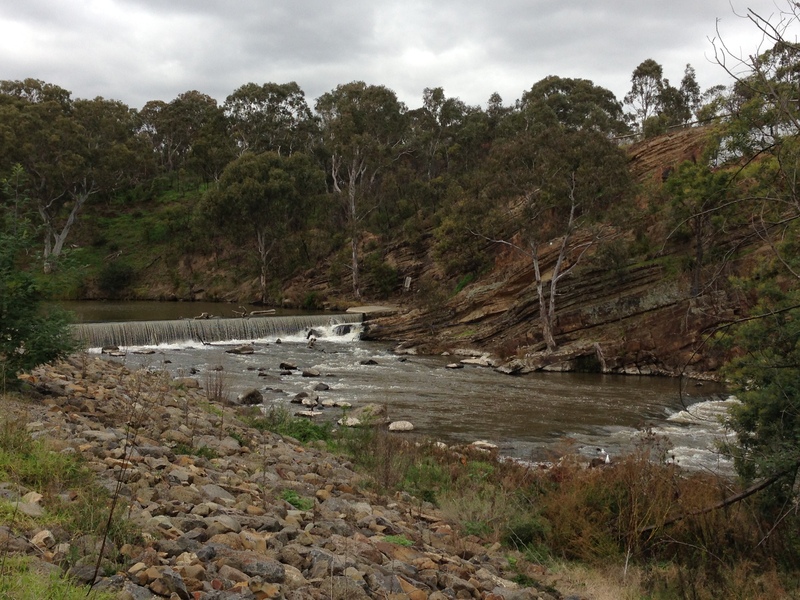 Dight Falls – not exactly what I was expecting. So that was the first of 21 walks around Melbourne we are going to take. I’m not going to put a date on it, we will get round to it around all of our sports commitments! I enjoyed it today but it once again proved that there’s loads about my home town that I just do not know! I thought I was pretty knowledgable about Melbourne but looks like I’m just really not! There is one thing that never changes though, the cakes at Brunetti on Lygon St rock! We stopped there on the way home, for coffee, cake and ice cream. Craig thinks they have the best coffee in town, I’ll believe him because I don’t drink coffee. The hot chocolate was pretty damn fine though. I had a awesome lemon tart and followed it up with a scoop of salted caramel macaroon ice cream, what a piggy! 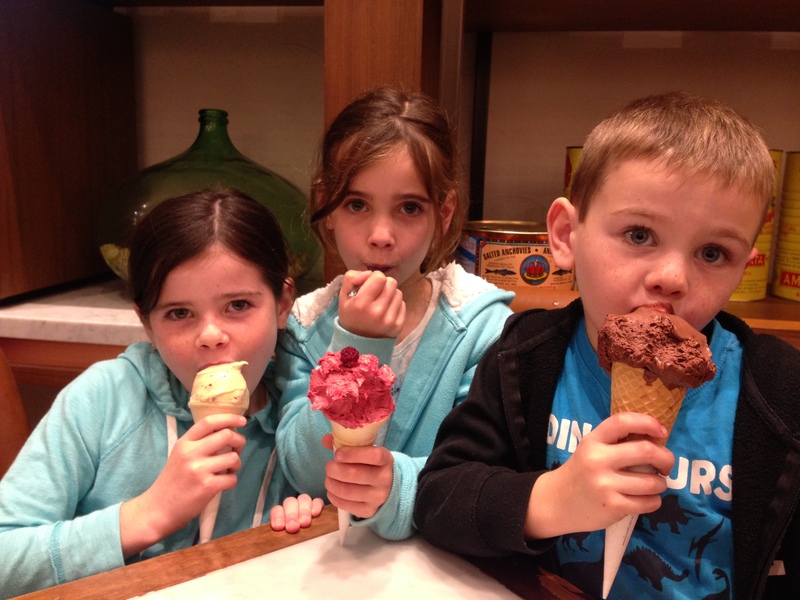 The kids had an ice cream of course. A well earn ice cream! We are off to Tassie on the Spirit of Tasmania this Thursday so will soon have plenty to write about. Next on our around Melbourne list is likely to be the Collingwood Kids Farm and Market. We are going to make the most of the kids not having sport the weekend that we get back from Tassie. If you are looking for other fun things to do in Melbourne don’t miss my top 7 free things to do in Melbourne post or visit Luna Park, the theme park is over 100 years old. Hi Sandra, wasn’t it a great post from Buzzfeed, We are not far from Geelong so will definitely check out Serendip Sanctuary at some stage. Its nice to get the kids out and about as these days they are happy enough to sit on their iPads all day. I will check out your post and the rest of your blog, we are heading off to Tassie tonight on the Spirit of Tassie so really looking forward to that. Hope you are enjoying the school holidays, weather has been so mild for this time of year. Take care and thanks for your comment. How are you enjoying your Tassie trip? Highlights so far? Did the kids love the Spirit of Tasmania crossing? I hope you got good weather for the trip over and the seas weren’t too rough. I’ve been to Tassie a few times. It’s such a beautiful place and so compact. It’s somewhere I’d like to take Alex for a summer camping trip when he’s a bit older. Trip going well Sandra, highlight definitely Cradle Mountain even though it was cold & wet! The crossing was super rough & Alannah was sick but I think it was more nervous & it was a bit scary, even I was a bit concerned!